EMI financing and medical expenses are the top reasons why salaried millennials availed loans in 2018, according to a report by CASHe, an online digital lending company for working professionals. The company, which gives out instant personal loans, surveyed the buying and borrowing behaviour of about 100,000 active customers on its platform. “Easy access to borrowing, living away from parents, and independence from needing to support dependents, along with low levels of financial literacy on the true cost of borrowing are common reasons why millennials are borrowing more. In addition, lack of focus on creating a contingency fund is a cause for borrowing for health emergencies,” said Vishal Dhawan, founder and CEO, Plan Ahead Wealth Advisors. While 31% millennials borrowed for medical expenses, 23% opted for loans to finance their EMIs. “Millennials are becoming more independent. They want their own personal space to live, their own vehicle, and so on. They do not wish to compromise on the quality of life they are leading,” said Navin Chandani, chief business development officer, BankBazaar. As much as 64% demand for credit came from younger millennials, individuals between 21 and 30 years of age, while the demand from older millennials made for only 36% of the total borrowing, which shows that more individuals who’ve just entered the workforce are opting for digital short-term loans. Chandani said that short-term loans are accessed more by people who have recently started earning; a slightly older customer segment that has been on the workforce for a few years now have very different credit requirements. “We see a lot of people even above 35 taking loans. By the time you are 30, your financial goals are different. So it is an entirely different segment, and short-term loans are not what they would look for,” he said. 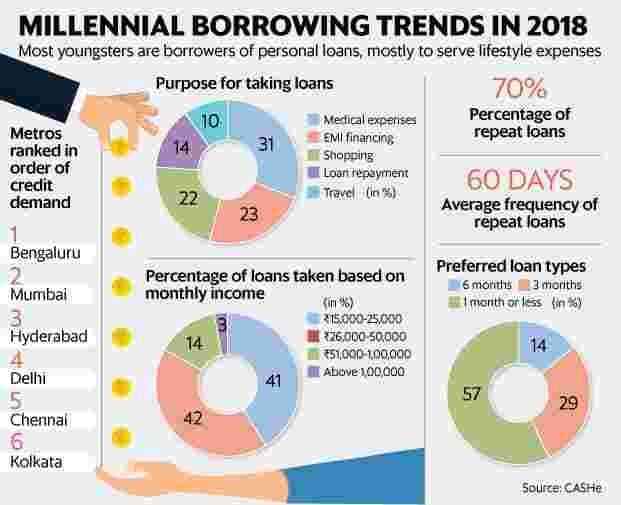 The report said that 23% millennials in India resort to lending for travel and lifestyle expenses and the average frequency of repeat loans is 60 days. 41% of the total demand came from people who earn between ₹15,000 and ₹25,000 while those who earn upwards of ₹1 lakh made for just 3% of the total borrowers. “Millennials believe in socializing, and being part of a group comes with its own problems. A group usually has people with different income levels and there is a desire to belong without completely understanding your own financial capabilities,” said Dhawan. Borrowing for most millennials is not a one-time affair, shows the report. As many as 70% of CASHe’s customers are repeat borrowers. This shows how young Indians are resorting to procuring short-term personal loans quite often. Though it is easy to access loans, one must remember that the cost of borrowing is quite high in terms of the interest and processing charges. CASHe charges ₹500 for a 15-30-day loan of up to₹15,000 and interest of flat 1.75% for 15 days, which is increased to 4% if you take an extension of another 15 days. For a 30- day loan, CASHe charges an interest of 3.25% and for a one-year loan tenure, the company charges an interest of up to 2.50% per month. This translates into 30-35% rate per annum. Processing fees rises as the borrowed amount increases. There are also late-payment charges if you are unable to repay your loan on time. For a 30-day loan, the interest levied is 3.25% and a delay attracts a 3% flat interest fee. It is important to understand the process and how much you’ll end up paying out before opting for a loan. It is always better to plan your finances rather than borrowing for your everyday expenses. Make a budget and plan how much you should shell out on your fixed and discretionary spends. Don’t get tempted to spend more just because somebody else is. Their earning capacity could be very different from yours. “Save before spending; separate your fixed and discretionary expenses. Have a portion of your income move to investments as soon as your salary is credited to cover contingencies. Remember that incomes can fluctuate and, therefore, avoid borrowing for today’s spends just because you expect your future income to increase,” said Dhawan.